1. Emphasizing momentary failures hinders long-term weight-loss success. 2. Quoting Barbara Rolls, professor of nutritional sciences at Penn State and author of The Ultimate Volumetrics Diet: The biggest myth about willpower is that it’s always going to be there. We all have moments of weakness, but if you find that motivation it’s going to be easier. But it’s not easy. 3. Self-control with food eludes everyone eventually. If you keep your eye on the long-term goal – new habits, overall behavioral changes – a short-term setback loses it’s symbolic power. 4. 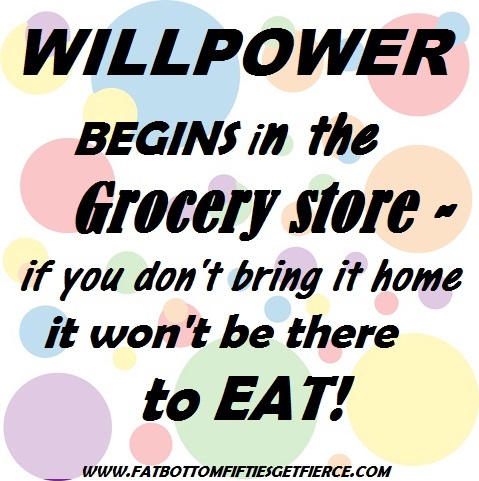 The side effect of putting too much stock in the idea of willpower is what obesity researchers call the “What the Hell?” effect: As soon as you eat something you think you shouldn’t have, you figure you’ve already blown it for the day, so what the hell – you might as well keep going. But all is not lost because of one choice – you can do some calorie-compensation at the next meal.